Major shrine Durham Cathedral, County Durham. Bede (IPA: /biːd/), also Saint Bede, the Venerable Bede, or (from Latin) Beda (IPA: /beda/), (ca. 672 or 673 – May 27, 735), was a Benedictine monk at the Northumbrian monastery of Saint Peter at Wearmouth. He is well-known for his considerable writings, the most important of which, Historia ecclesiastica gentis Anglorum (The Ecclesiastical History of the English People), has gained him the title "The Father of English History." In addition to being a historian, Bede was an active writer in a variety of genres, including science, music, poetry, and theology. He is also one of the earliest writers of any genre to have emerged out of medieval England. With respect to literature, Bede is known primarily for two reasons. First, through his Historia he has become known for assiduous scholarly practices. He is the first writer to rigorously cite his sources, rarely making an assertion without having a substantial body of documentation to support his argument. His method of documenting his sources—and always being critical of their veracity—has become the de facto standard for academic writing. In addition to this, Bede is also known to literature for the composition of a brief poem, known to scholars as "Bede's Death Song" that, despite its brevity, is one of the most important poems for scholars of Old English because it is one of the earliest preserved works written in the language. Bede's contributions to history and to the art of writing have not gone unnoticed. He is the only Englishman in Dante's Paradise (Paradiso X.130); and the only English Doctor of the Church. Bede is a seminal figure in the history of English letters; his work would go on to influence the culture of Old English society at large, inspiring countless historians and authors, from Chaucer to King Alfred. Almost all that is known of Bede's life is contained in a notice added by himself when he was 59 to his Historia (v.24), which states that he was placed in the monastery at Wearmouth at the age of seven, that he became deacon in his nineteenth year, and priest in his thirtieth, remaining a priest for the rest of his life. He implies that he finished the Historia at the age of 59, and since the work was finished around 731, he must have been born in 672/3. He died on May 25, 735. It is not clear whether he was of noble birth. He was trained by the abbots, Benedict Biscop and Ceolfrid, probably accompanying the latter to Wearmouth's sister monastery of Jarrow in 682. There he spent his life, with his prominent activities evidently teaching and writing. There likewise he died and was buried, but his bones were, towards the beginning of the eleventh century, removed to Durham Cathedral. 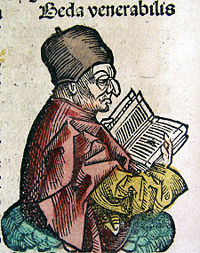 Depiction of Bede from the Nuremberg Chronicle, 1493. His works show that he had at his command all the learning of his time. It was thought that the library at Wearmouth-Jarrow was between 300-500 books, making it one of the largest in England. It is clear that Bede's mentor, Benedict Biscop, made strenuous efforts to collect books during his extensive travels. Bede's writings are classed as scientific, historical and theological, reflecting the range of his writings from music to poetry to commentaries on scripture. He was proficient in Church literature as well as the classics, and he quotes Pliny the Elder, Virgil, Lucretius, Ovid, Horace and other writers, though with some disapproval. He knew some Greek, but no Hebrew. His Latin is generally clear and without affectation, and he was a skillful story-teller. However, his style can be considerably more difficult in his Biblical commentaries. Bede practiced the allegorical method of interpretation, and was befitting his times, credulous concerning the miraculous; but in most things he shows a great deal of good sense, and his kindly and broad sympathies, his love of truth and fairness, his unfeigned piety and his devotion to the service of others combine to make him an exceedingly attractive character—a writer who not only wrote well, but lived well. The most important and best known of his works is the Historia ecclesiastica gentis Anglorum, relating in five books and 400 pages the history of England, ecclesiastical and political, from the time of Caesar to the date of its completion in 731 C.E. The first twenty-one chapters, treating the period before the mission of Augustine of Canterbury, are compiled from earlier writers such as Orosius, Gildas, Prosper of Aquitaine, the letters of Pope Gregory I and others, with the insertion of legends and traditions. After 596, Bede uses documentary sources, which he took pains to obtain from throughout England and Rome, as well as oral testimony, which he employed with critical consideration of its value. He cited his references and was very concerned about the veracity of his sources. Bede has often been referred to, somewhat jokingly, as the "father of the footnote," but the attribution is quite apt; Bede was the first author in any language to rigorously trace his sources, and as a result he set a precedent of scholarly accuracy for writers across the range of disciplines. Bede's attention to sources makes him one of the most reliable and valuable historians of his time. In Historia Ecclesiastica (I.2), he created a method of referring to years prior to the Christian era. He used the Latin phrase ante incarnationis dominicae (before the incarnation of the Lord), which would eventually enter the English language as "B.C." or "Before Christ." Bede lists his works in an autobiographical note at the end of his Ecclesiastical History. He clearly considered his commentaries on many books of the Old and New Testaments as important; they come first on this list and dominate it in sheer number. These commentaries reflect the biblical focus of monastic life. "I spent all my life," he wrote, "in this monastery, applying myself entirely to the study of Scriptures." (Bede, Hist. eccl., 5. 24). 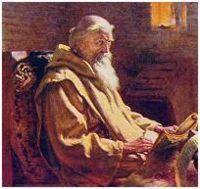 His other historical works included lives of the abbots of Wearmouth and Jarrow, as well as a biography, written in verse, of the life of St. Cuthbert of Lindisfarne. In his Letter on the Death of Bede, Cuthbert describes Bede as still writing on his deathbed, working on a translation into Old English of the Gospel of John and on Isidore of Seville's On the Nature of Things (McClure and Collins, 301). The noted historian of science, George Sarton, called the eighth century "The Age of Bede;" and clearly, Bede must be considered as an important scientific figure. He wrote several major works: a work On the Nature of Things, modeled in part after the work of the same title by Isidore of Seville; a work On Time, providing an introduction to the principles of calendars, focused particularly on computing the date of Easter. Bede wrote a longer work on the same subject, On the Reckoning of Time, which became the cornerstone of clerical scientific education during the ninth-century. He also wrote several shorter letters and essays discussing specific aspects of the calendar and a treatise on grammar and on figures of speech for his pupils. Although Bede's authorship of this poem has been disputed, it is nonetheless of significant literary value as one of the earliest examples of Old English poetry. At a time when almost all literature in England was composed in Latin, Bede's Death Song is a valuable fragment of the Old English language at its height, as well one of the few recorded examples of an extensive oral Anglo-Saxon poetic tradition. Colgrave, Bertram and R.A.B. Mynors (eds.). Bede's Ecclesiastical History of the English People. Oxford, 1969. All links retrieved May 25, 2016. Ecclesiastical History of the English Nation, Books 1-5, L.C. Jane's 1903 Temple Classics translation. From the Internet Medieval Sourcebook. Bede's Ecclesiastical History and the Continuation of Bede (pdf), at CCEL, edited and translated by A.M. Sellar. The Venerable Bede Catholic Encyclopedia. The Venerable Bede from In Our Time (BBC Radio 4). This page was last modified on 25 May 2016, at 14:30.